Julie L. Moore is an Ohio poet with two full-length collections to her credit — Slipping Out of Bloom (2010) and Particular Scandals (2013) which is part of The Poiema Poetry Series from Cascade Books. Her poems have appeared in over 100 publications, and she is the recipient of many awards, including the Paul Mariani Scholarship for Excellence in Poetry from Image’s Glen Workshop. 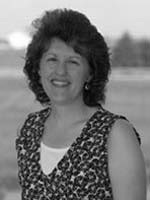 She is the Writing Center Director and an Associate Professor of English at Cedarville University in Ohio. Jeanne Murray Walker said of Julie L. Moore’s earlier collection: “Her poetry refrains from overstatement and extravagant gesture. It delineates many subtle colors on the palette of human suffering and faithfully documents nuances of joy.” This same strength was clear to me when I received the manuscript for Particular Scandals. I was immediately drawn in, poem after poem, and knew I wanted to include it in the Poiema Poetry Series. The following poem is from Particular Scandals, and was the 2008 winner of the Janet B. McCabe Poetry Prize from Ruminate, as selected by Luci Shaw. --------burned. The once-soft skin of her labia. The pathetic pulp of her womb. --------And the mass of hard questions. --------to yourself. Whatever you touch you foul. But she reached for him anyway. onto the lip of his cloak. This is the first Kingdom Poets post about Julie L. Moore: second post.